This was an historic meeting indeed. 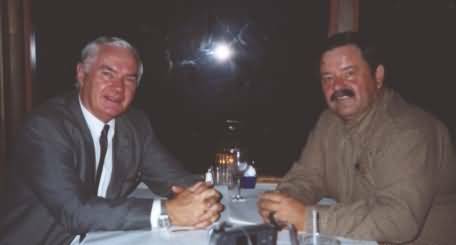 Rudi and Ned, collaborators on this site, met in person for the first time on August 28, 2002 in Oakland, California, USA. We have worked together since December of 1998, attempting to present the information you have all shared with us about your Braatz/Bratz families and heritage on this web site. Here is a picture of us enjoying dinner overlooking the San Francisco Bay on Pier 39, San Francisco, California, USA. This may well have been a reuniting of two Braatz's coming from a common ancestry of 200 years ago or more. It is also the Northern Hemisphere and the Southern Hemisphere meeting, as Rudi traveled from Brazil to meet with Ned, from the United States.